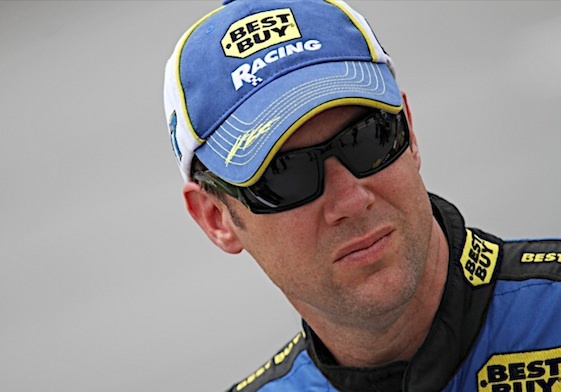 As expected, Matt Kenseth will drive a Sprint Cup car for Joe Gibbs Racing next year. The long-anticipated announcement of that was made during a jovial press conference held Tuesday at the JGR team’s Huntersville, N.C. shops. “In this sport, you’ve got to have somebody who can really wheel it,” team owner Joe Gibs said. Kenseth, he said, has proven that. “It’s a big deal for Joe Gibbs Racing,” team president J.D. Gibbs said. During the press conference Tuesday, J.D. Gibbs gave a hint as to the future of Joey Logano, who had been in the seat of the No. 20 Toyota which Kenseth will begin occupying next year. He said that JGR was hoping to run Logano full-time in the Nationwide Series with forays into Cup in 2012. But, Gibbs said, “Obviously when the 22 car (of Penske Racing) opened up, we knew that might look different. The 22 car of Penske began the year with A.J. Allmendinger behind the wheel. When Allmendinger was suspended by NASCAR for failing a drug test, veteran Sam Hornish Jr. stepped in. Hornish had hoped to drive the No. 22 car full time next year, he has said. Kenseth has been driving full-time in Cup for Roush Fenway Racing since 2000. During his Roush tenure, Kenseth, a native of Cambridge, Wis., won 22 races and the 2003 cup championship. He is a two-time winner of the Daytona 500. “At end of the day, it was a real unique opportunity,” Kenseth said. Kenseth is currently third in the NASCAR Sprint Cup Series point standings with a win, nine top-five and 14 top-10 finishes. He will join drivers Kyle Busch and Denny Hamlin at JGR. Kenseth started his racing career at the age of 16 and was an instant success winning his first feature race in just his third outing. By the age of 19 he was winning races across the state of Wisconsin and in 1994 he would become the youngest driver to win the Slinger Nationals, one of the most prestigious short track races in the country. From there he would successfully move through the ranks of the NASCAR All-Pro Series (1995), USAR Pro Cup Series (1996) and American Speed Association (1997). He would make his debut in the NASCAR Nationwide Series in 1997 and run his first full season in the Series in 1998. He has 248 career Nationwide Series starts with 26 wins, 118 top-five, and 168 top-ten finishes.